Copyright 2015-2018 Cheryl Thompson | Jewels of the Vineyard. All Rights Reserved. 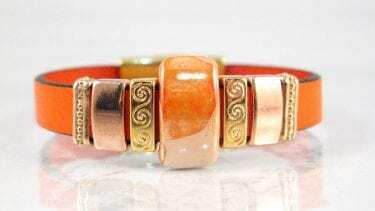 Q: How can I make sure the bracelet is the correct size? 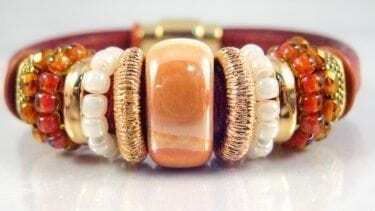 A: Jewels of the Vineyard bracelets, especially the Stag’s Leap Collection bracelets, are made to fit your wrist comfortably but snug enough so that they will not twist around and leave the beads underneath. To assure the bracelet is the correct size, wrap a piece of string or slim paper around your wrist and mark where it meets. The length of that string/paper is your wrist measurement. Q: What should I do to care for a piece that I purchase from Jewels of the Vineyard? A: Jewels of the Vineyard bracelets are all leather products. Slight scratches and scuffs can be removed with paste shoe polish to match the color of the leather. 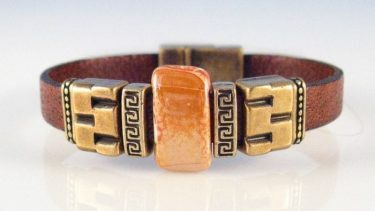 I use a leather preservative to keep the bracelets soft and protected. 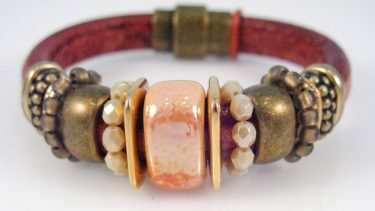 Silver and gold plated beads can be polished using a polishing cloth or Q-tip and polish. Gently rub off with a soft cloth. Q: How are your pieces made? A: All pieces are created at my studio in the Napa Valley using leathers from Spain, Greece and Italy. I search the globe for beads to dress the leather. Most beads are made from metal alloy and plated with silver or gold or made from fine Swarovski crystal, glass and ceramic. Q: I ordered an item today when can I expect to receive it? A: Generally items ship within 1-2 business days from California via USPS with a tracking number. Although it is impossible to tell exactly when a piece will arrive, you should expect that for most of the continental US, within 7 business days. International shipments will take longer depending on the country. A: Returns are accepted on undamaged items within 10 days. Please return in original packaging. Unfortunately, return shipping costs are not refundable. 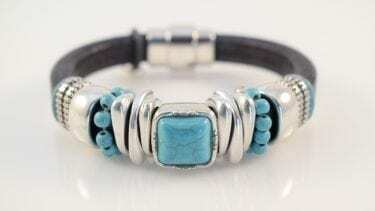 Custom made items, including special sized bracelets, are not returnable without a return authorization. Please send an email for authorization if necessary. If you have any questions or feedback, please email me directly at cheryl@jewelsofthevineyard.com.